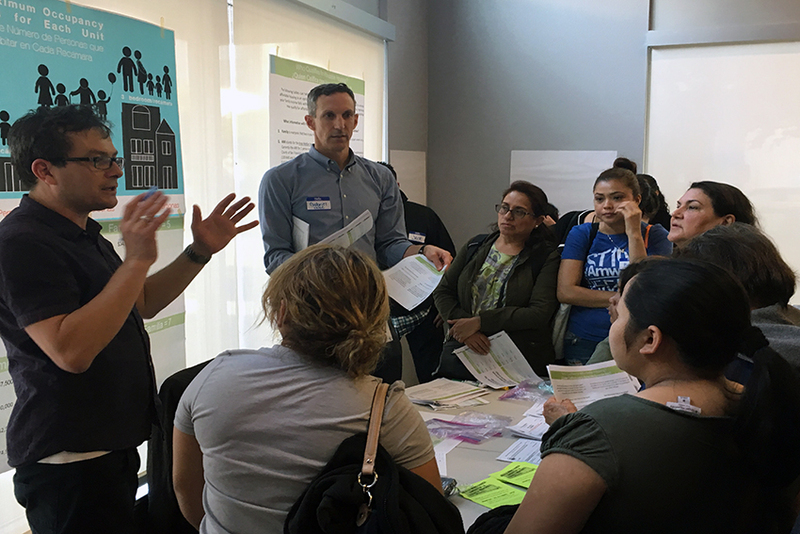 Some 60 people, including whole families, turned out for the first in a series of community outreach meetings concerning the construction of a 130-unit affordable housing project at 681 Florida St. that could break ground in Spring 2019. People were there to learn about applying for the spaces and to make suggestions on the use of its community space. Those who attended Tuesday’s meeting were counseled on their eligibility for below market rate housing and assisted with filling out applications. They were told that the application process for 681 Florida St. will begin some six months before construction completion, which is set for Summer 2020. Along with representatives from the project’s non-profit developers, the Mission Economic Development Agency and the Tenderloin Neighborhood Development Corporation, the architects presented preliminary design plans for 681 Florida St. and sought input from those whom it will serve. The nine-story development is slated to bring 130 below-market rate units ranging from studios to three-bedroom apartments to the Mission, of which 30 percent will be set aside to house formerly homeless families. Another important aspect in the project’s design is accessibility to supportive services – such as case management services – that will be located within the building. The building will come complete with a community room, a receptionist, storage space for some 120 bicycles, and a rooftop deck and laundry access, as well as 10,000 square feet of Production Distribution Repair space that will be used to house local arts and community organizations on its ground floor. 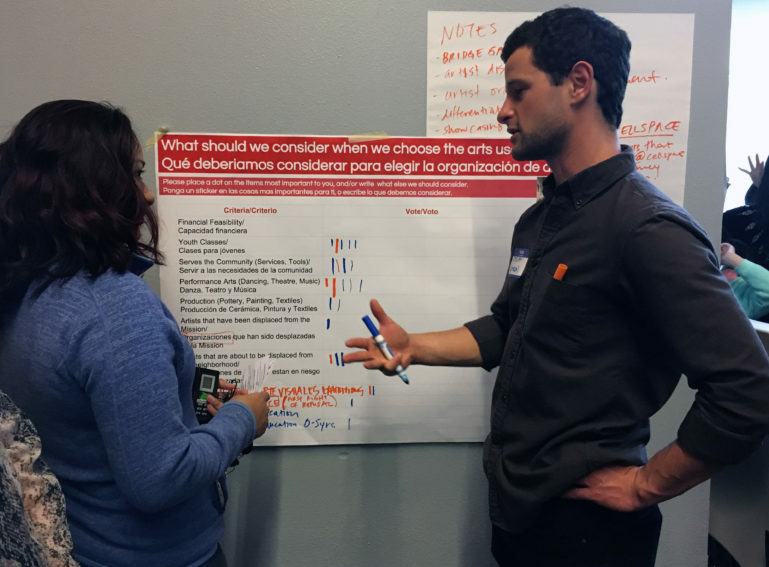 Following a 20 minute presentation, attendees were directed to break off into groups to give their input on a variety of issues concerning the project, including access to transportation in the area and their preferred use of the art space planned for the development’s ground floor. Members of local art organizations attended the meeting to help inform the space’s use and design. The project’s developers will ultimately be tasked with choosing tenants for the art space. Gula said that the architects are designing the the space in preparation for variety of uses and organizations – from small art galleries to a large dance studio. “It’s a flexible space and whoever comes in can do a variety of different things if they wanted to,” said Gula. “It’s giant – it’s 21-foot ceilings and spans an entire block from Florida to Bryant streets,” said Logan Kelley, the other architect on the project, about the proposed PDR space. The design will include windows providing “visibility from all three sides of the building,” he said. The affordable housing project is part of a larger project of mostly market-rate development between 18th and 19th streets on Bryant Street and came after months of negotiations between community groups, the city and the developer Nick Podell. Those who attended the meeting said they were happy their voices were being heard throughout the process.